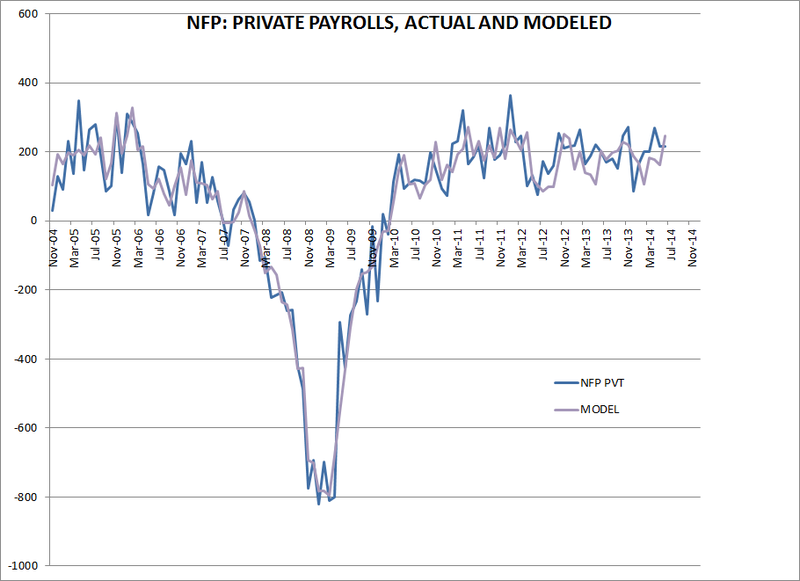 Macro Man's model suggests NFP of 250 today. Another solid NFP print, but I'm not sure the data really matters lately in terms of prices. The hand waving "too far too fast" people short equities will find some nit to pick, or point to how far we are past yellens initial U6 target we are but it does not matter. In a sense are a turning Japanese, except with a roaring stock market. revisions were higher as well. Current reading 6.1. Hey Fed, unemployment still 'elevated'? At some point you have to stop positioning on what you think the fed should do versus what they say (and are) doing. Ideally, that was 1000 points ago on the 'spooz, but now is probably as good a time as any. Wasn't the gist of Yellens speech yesterday that the fed shouldn't pop bubbles, that it was a mistake to pop the housing bubble, and that anyways, higher rates wouldn't have done anything? I read that as "I'm targeting main street, I don't really care what happens on wall street". There are valid arguments on either side, but if thats what she is saying, and the ECB/BOJ are right there with her, and there is no dissent on the fed, it seems crazy to piss into the wind against this. I'm not short stocks, much to the contrary I am playing the game much like everyone else. CS Fear index, the cost of selling puts vs buying calls on SPX just went nutty. Seems like the options market doesnt believe in the rally through the autumn.